We were thrilled to welcome five National Cartoonists Society artists at this first-time event in Chicago! These artists and the kids of Children’s Memorial did a fantastic job making cartoon holiday cards together, and in making even more cards for those kids who weren’t able to make it down to the rec room. Thank you thank you thank you to Brian Kelly (Event Leader and NCS Chicago Chapter President), Brian Diskin, Charles Boyce, Ann Farrell, and Timothy Jackson! Elana Amity, Oded Naaman and Elizabeth Winter made some fantastic, festive decorations and holiday cards with the kids at Mount Sinai! We each took a turn on KidsZone TV then got to draw in person with more kids in the studio. One little girl drew loads of portraits of the puppet co-host, Panina, another created a green skinned fairy princess who was friends with all the birds, and another got stacks of Rugrats drawings. Thanks, everybody, for a great night! 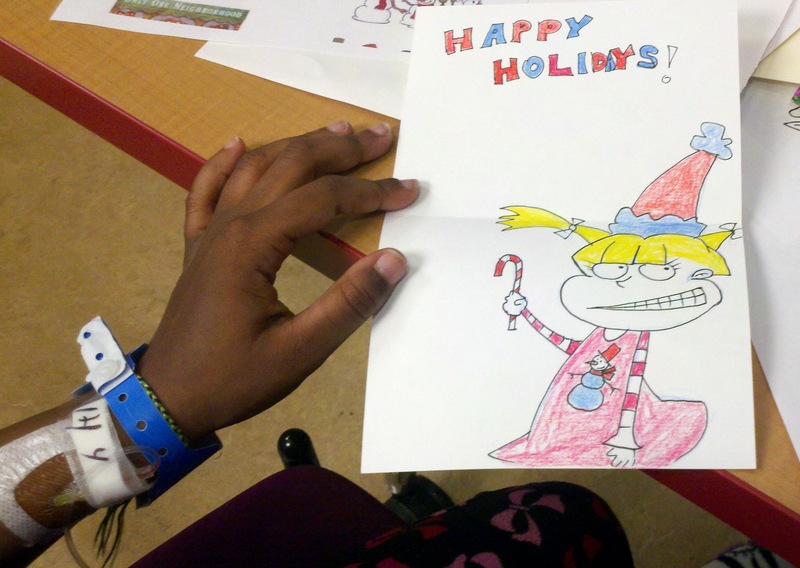 We had a super fantastic time making flip books with the wonderful Bellevue Hospital kids! The kids dreamed up brilliant characters like tornado boy, vanishing girl, and the fish bird and we all had a ball learning about this fundamental animation technique together. Thank you, Elana Amity, Jane Archer, Jeanine Henderson, Franz Palomares and Elizabeth Winter for volunteering your fabulous artsiness.